Celeriac (a.k.a. turnip-rooted celery, knob celery, or celery root) is a type of celery that is grown for its edible roots, hypocotyls, and shoots. Celeriac taste very similar to the upper part of the stem of celery, it is a little bland and and slightly bitter. The skin of celeriac is an off white color and the inner flesh is white like a potato. 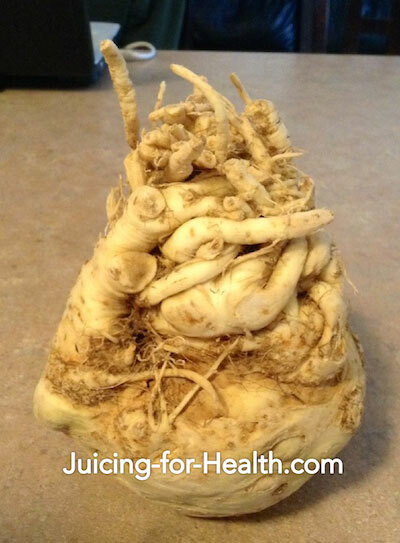 It looks like a big “ugly” bulb but do not underestimate this root that is a nutrient powerhouse, highly nutritious, as with many other root vegetables. Celeriac is high in dietary fiber and protein as well as many crucial vitamins and minerals. Celeriac has high contents of vitamins C and K, and various B vitamins such as, thiamine (B1), riboflavin (B2), niacin (B3), pantothenic acid (B5), and vitamin B6. It is rich with calcium, iron, magnesium, manganese, phosphorus, potassium, sodium, and zinc. Anti-aging: The organic sodium in celeriac juice can help remove acid from the body, reduce stiff joints and make the muscular skeletal frame flexible. Anti-cancer: The high content of antioxidants in celeriac helps prevent cell oxidation. It is rich in anti-cancer properties that may help fight colon cancer. Blood levels: The high content of iron in celeriac helps balance blood levels in anemic patients and pregnant women. It may also help with bleeding problems and restore blood levels to prevent illnesses. Bones health: Celeriac juice helps reduce high acidity in the body that causes damage to bones. Copper and phosphorus are important minerals for bone metabolism and vitamin K helps increase bone mass. Common cold and flu: The high vitamin C and other antioxidant content in celeriac in the right proportion makes celeriac an excellent food for boosting the immune system, and fight or prevent colds and the flu viruses. Digestion: Celeriac is high in dietary fiber and aids in healthy digestion and metabolism. The slight bitterness in celeriac are its medicinal properties that help bile production in aiding with digestion. Good digestion and regular bowel movements help prevention of colon cancer. Heart health: Celeriac is low in cholesterol and saturated fats. By including celeriac in your diet, you may reduce the risk of heart-related diseases like heart attacks and cholesterol build-up in the arteries. Immunity: The anti-microbial properties in celeriac makes it effective for boosting the first line of defence in the digestive tract, thus boosting immunity, helps improve colon health and overall wellbeing. Insomnia and nervous disorders: Consuming celeriac juice revitalizes the brain and helps enhance memory and prevent dizziness. Celeriac juice calms nerves and induces deep restful sleep. The high potassium content helps improve neurotransmissions among nerves. Joints health: A diet that is high in animal protein, grains, refined and concentrated sugars and starches can cause harmful build-up of acid in the body. Celeriac juice may be beneficial for such individuals who suffer from high acidity that causes damage to the joints. Regularly drinking celeriac juice may help to eliminate excessive calcium deposits that cause painful damage. Kidney cleanse: Celeriac is used in the hippocrates soup often consumed by Gerson Therapy patients. It is said to be highly effective for cleansing the kidneys. Weight loss: A glass of celeriac juice with a teaspoon of raw honey before a meal may help you feel full quicker and longer. This will help you from overeating at meal time. It is an excellent drink to rehydrate and replenish the body with minerals after exercise and improves digestion. The high soluble fiber content makes celeriac juice an excellent addition to a healthy diet. It has a mild diuretic effect and can control the cravings for sweet treats. Celeriac can be juiced and mixed with other vegetable or fruit juices for its excellent nutritional benefits. Celeriac is delicious when juiced with apples and/or carrots. It can be roasted, stewed, blanched, or mashed like potatoes. Slice celeriac and add it to soups, casseroles and other savory dishes. This root vegetable will store for about 6 to 8 months in 32 to 41 degree temperatures, as long as it isn’t dried out. Celeriac medicinal supplement should be avoided during pregnancy because it can cause sensitivity problems like photo toxicity. 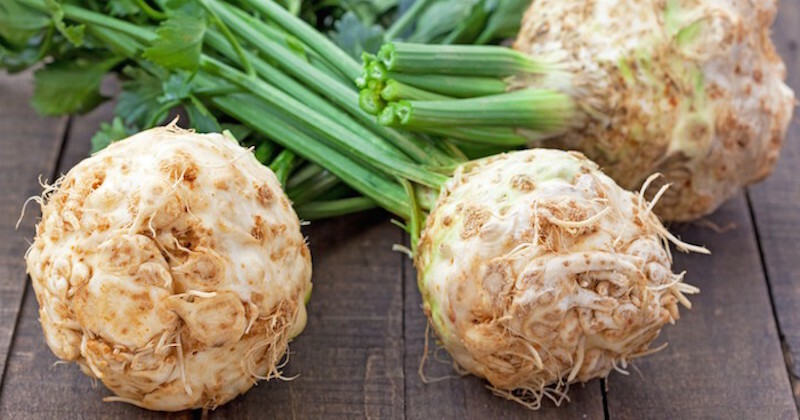 Celeriac should not be taken in excess with diuretic and anti-coagulant medication.